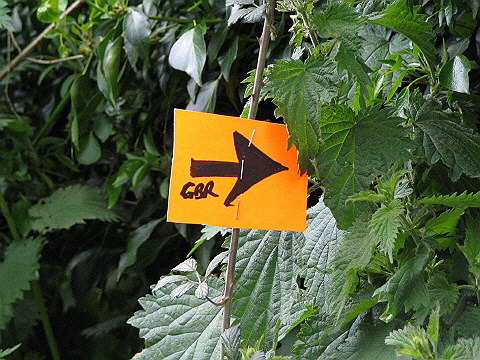 The Green Belt Relay follows much of the Green Belt Way. It starts at Hampton Court and ends just a couple of miles away in Kingston, but taking a detour around 220 miles of footpaths, minor roads and towpaths around the outside of London. THE ROUTE IS VERY COMPLEX AND IF YOU DON'T PREPARE YOU WILL GO WRONG! We do our best to mark the course in advance of the race and you do not need any special navigation skills, but you can not rely solely on the markings - they get removed or washed away, and you MUST bring a copy of your map. It is well worth at least spending an hour or so familiarising yourself with the main turns, but if you want to be sure, we recommend you use a GPS. The entire course is available on the Viewranger app, in the pre-loaded route GBR 2019 Full Course. Individual stages are also available on Map My Run (see links in the table below). You can also download a GPX file of the full route here. We recommend that you use one of these if you want to minimise your chances of getting lost. The table below provides you with the details needed to run a stage. Difficulty: Each stage is rated 1 - 10, 10 being most difficult. Stages 4, 5, 16, 18 and 19 are the toughest and times in these count towards the Kings (and Queens) Of The Mountains awards. Cut-off time: if you are outside this time (or you miss the stage), we will record your time as the cutoff time. You are welcome to finish your stage and your result will be included. If you miss or fail to complete a stage, we will also record your team result with the cutoff, but your team will not be eligible for team prizes unless you have completed every stage. The GPS link provides a version of the stage map on MapMyRun. Our experience suggests that it's simpler to download the entire route map on Viewranger in a single route, but if you want just the stage get it here. Green Belt Relay 2019. All Rights Reserved.